Maya got her initial training with Ignacio Sotolongo of Zacatecas, Mexico and spends summers here in Zac. She describes her experience as a first year dance student in Cuba, heading back there soon. Easy to Love by Doris Day presents the backdrop for this short dance by Polly Wilkinson in Alexandra’s beautiful new studio in Zacatecas, Mexico. 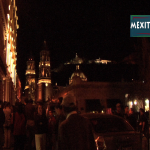 The talented Hugo Mendez of San Luis Potosi, MX created this video about the extraordinary Day of the Dead celebrations in the Huasteca region of SLP state. The region is dominated by agriculture, sugar cane fields. Its hot and humid, a contrast to the Altiplano high desert that covers the rest of the state. Due to its isolation, foreign tourists rarely get there which is a shame, the area is loaded with waterfalls, warm turquoise rivers, some pyramids and some hot springs, and indigenous communities who continue traditional lives. Some tourist Eco projects & cool hotel/resort venues are happening (huastecasecreta.com ex. ), the SLP Bicycle Vuelta hits Ciudad Valles and explores the area, and the famous Castillo and jungle art of Sir Edward James draws visitors to Xilitla in the southern Huasteca, a region of coffee growing and cooler altitudes. In this exhibition spring 2011 at Arroyo de la Plata gallery, Jesus (Chucho) Reyes explores surrealistic technique such as found objects and free association, in a wild large format piece that includes manipulated desert images, a body painting festival, masks, as well as a brilliant palate of colorful design pulling it together. 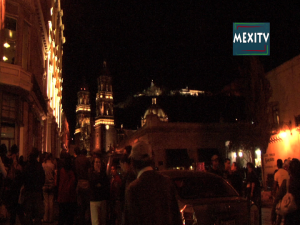 This exhibition was chosen as one of the cataloged players in the 2 week Cultural Festival of Zacatecas 2011.